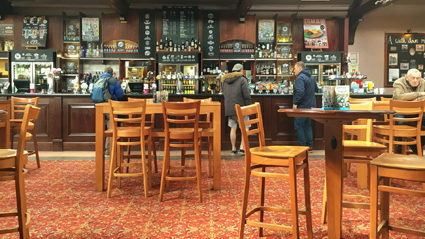 WETHERSPOON customers are demanding that the pub chain opens its doors at five in the morning. Regulars have asked the pub company to bring forward opening times from 8am, to ensure that they do not waste the early morning in sobriety. Norman Steele, who basically lives at his local Wetherspoon, said: “Being forced to wait until daylight before we can begin our morning’s imbibing is an abuse of our human rights. “Society is skewed towards the fickle demands of the evening drinker, or worse, the weekend drinker. Steele underlined seasoned drinkers’ importance as a force for social change: “You know when you go to Gatwick and have that 8am pint before departure? Who do you think won you that privilege? Do you know how many capillaries we had to burst in our noses to get them to open that early? PRINCE Harry has asked girlfriend Meghan Markle if she’d like to be the subject of future speculation about her mysterious disappearance. The handsome prince popped the question over the weekend, asking the actress how she’d feel if some American cable channel made a 2021 documentary called The Meghan Mystery: The Illuminati Factor. A palace spokesman said: “After several years as a couple, Harry felt it was time to make her ultimate fate official. “He held Meghan’s hand and asked her if she’d like to begin the chain of events that will lead to her unexplained disappearance from a hotel room in Vienna. “For decades to come, books will be written and straight-to-Netflix documentaries made about that night and why the concierge appeared to have a walkie-talkie under his desk. “There will be many years of speculation that she was spotted in Amsterdam, Australia and on a Mars colony, but the real truth will remain elusive.